A poster called ‘Redeyes’ who works at Apollo Cinemas was quick to answer – and then some! I’m a projectionist at an all digital multiplex, we converted from 35mm in February. File size for that film was about 150 gig. Avatar 3D is about 280 GB. A poster responded, expressing surprise that couriers are still needed to move digital data around, and asking if they used a standard hard drive in a special caddy. 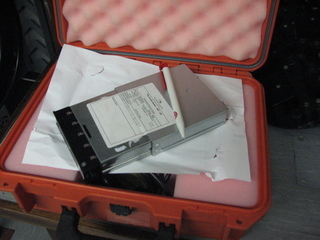 Yeah, it’s a standard hard drive, the caddy slips off so we can upload the data via a CRU port on our main server. Takes about 40 minutes to transfer a feature across from a portable drive. The technology is in place to deliver the files via satellite but from what I’m lead to believe there’s still concerns from the distributors about the satellite feed being intercepted, security of the data etc. The current method is pretty solid though. Even when the file is on our main server we still can’t play the film until we get a ‘key’ from the distributors. The ‘key’ is a coded file made specifically for our site telling the computer which screen we can play the film in and also to only allow it to be played within a specific time period. Redeyes was asked if digital movies were exclusively distributed on hard drives or whether other media like DVDs were used. All the ‘mainstream’ films come on hard drives. We have played a couple of films from DVD but they don’t look too good upscaled to 4K (we’re using the Sony 4K projectors). Luckily pretty much everything we need is available on hard drive, we’re a mainstream cinema in a fairly large town so our film booker tends to stick with the run of the mill crowd pleasers. The files on the drives are JPEG2000 and come in either 2k or 4k resolution with the files size being anything from 50gig to 400gig+. I’m not sure if a Blu-ray could carry that data (I think standard Blu-rays can hold up to 50gig? ), plus it would still need ripping from the disc and transferring to the main server. “What sort of signal is the server sending the projector out of interest? Not sure what you mean by ‘signal’, the files are JPEG2000 and are either 2k or 4k in resolution. The 3D is 2k dual image using the Sony RealD system. We can’t record the output as the part of the projector where the ‘key’ unlocks the ‘film’ is housed in an enclosure that is riddled with security devices. If I was to try and take a panel off that part of the projector the whole thing would shut down and we could only get back up and running after security checks are done and Sony re-set the server. Plus there’s no ‘out’ sockets to take a feed from, you’d have to hack into the electronics to get a signal output. Has digital got rid of projectionists jobs? Yes, I have a job. Though instead of having three projectionists we now have just the two. One person on duty at a time. 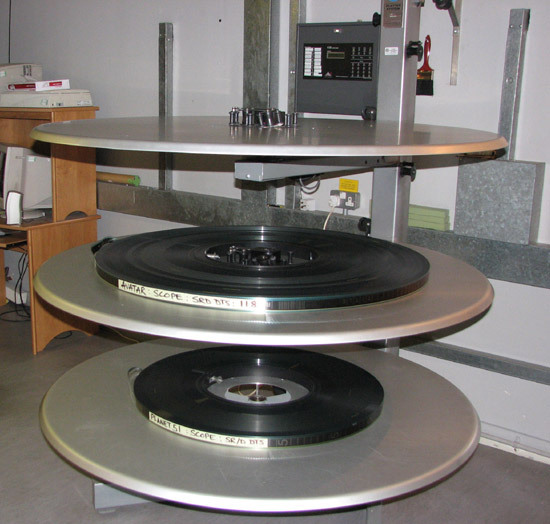 The automation that digital allows means we can finish our shifts before the last film has finished, whereas with 35mm we had to stay until the end, hence the loss of hours for our department. We don’t need to run around pressing play either, it’s all controlled from one main control centre. Then again when we had 35mm we didn’t need to run around pressing play either as the projectors set themselves off as they had onboard timers. There was also still only one person on duty at a time then too and we have 9 screens to look after. Back when we had 35mm the main bulk of my day was taken up by threading the projectors after each show and building up and breaking down the prints that were either coming in or on their way out. These days now we’re digital my job is more IT based with most of my work involving the transferring of the film files from the hard drives to our server, chasing up keys, scheduling the shows and maintenance around the building and in the projection box. No, back in the 60’s platter systems were invented that effectively changed the cinema industry. These systems allowed a film to be made up into one big reel and played from start to finish without the need for reel changes. This meant that multiplexes could have loads of screens and not have to pay someone to sit next to the projector and change reels every 40 minutes or so. 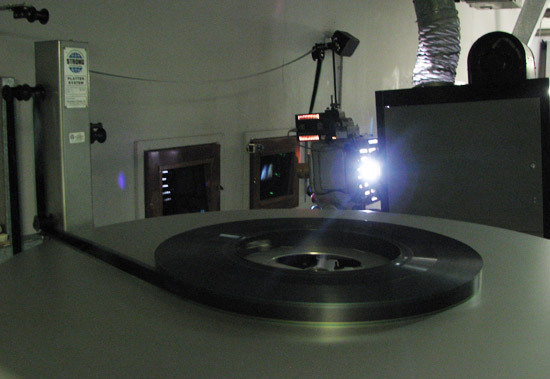 When the film had finished it was ready to go again, we’d take the film and lace it through the projector and it would run back onto the platter it was on previously. 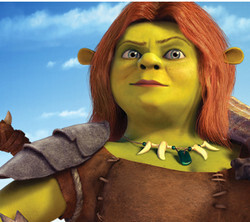 For the ‘big’ films like, say, TOY STORY 3 each site will get their own HD. Smaller independent films will have a lot fewer HDs which will be passed around. We had a show of LA TRAVIATA a few weeks back and we had to transfer it straight to our system and a courier picked it up the next day so it could go to another site. All the HDs get returned and re-used though. What do you think about the resolution and quality of the digital product? So far in the digital cinemas I been to, I have not been impressed by the digital copy. They all seem to have a problem with slow panned scenes looking jerky. After having looked at 35mm everyday since I started working in the cinema, which was back in 1997, I am really impressed with how the films look on screen at our place. Bear in mind though that we are using the Sony Cine Alta 4K projectors which can not only display 4K images but also upscales 2K images to 4K. I’d stick my neck out and say that the Sony projectors put out an image that is as good as a perfectly presented 35mm show. I’ve not had chance to see any films shown on other digital cinema projectors though so can’t really comment on the quality of those. Though I do know most of the digital projectors currently being used in cinemas are only 2K. View the original thread here. Very interesting stuff. Have they finally stopped making films on..er..film, then? This is amazing. Recently I was in India at one of the popular multiplex and out of curiosity asked one of guys how this digital movies are shown and he told me that they are all displayed via internet and data is coming from one secure place in Bombay. I was surprized to know that, what he meant that there is no local dvd or anything, but again he may not be very technical and what might be coming is only key. Or may be there is a technology in place to deliver movie via super speed internet securely without having any hard drives or secure drives. May be Bollywood has implemented this earlier than Hollywood. 1. E-Cinema: which is operated by Ufomoviez, Real Image & many more. 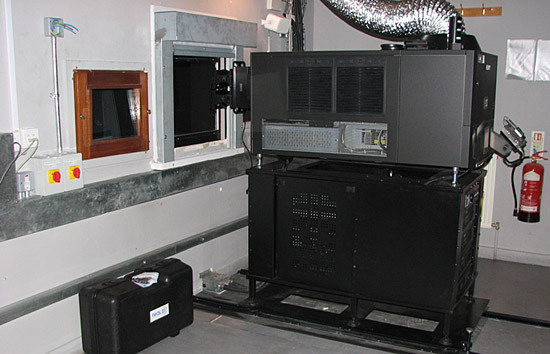 in this technology they use lower resolution projectors like Panasonic PT-DW6600 n PT-DW100E n Ray Photon etc.. this series is for cinema who don’t want to invest in Digital Cinema or as co-manly know in India as B-Grade cinemas, where they get these projector n server on rent basis starting from $120 – $450/month. Ufomoviez is only company in India, which uses V-SAT to transfer content to different location in India, they use MPEG-4 format in which movie size is only 4-5GB. Though these theaters only get Bollywood or local movies. Studios don’t approve these type of technology, as they are under resolution & there quality is way inferior then standard 35mm projector. 2. 2k & 4k Projector (co-manly know as Digital Cinema): in this technology in India, cinema owners need to purchase 2k or 4k Projectors from Barco or Christie. It require huge investment as entry level 2k projector cost around $40,000 + 30%duty in India. There are 2 2k vendors in India. i.e. Scrabble Entertainment, they offer Christie 2k or 4k with Doremi 2k Server. If a cinema converts to DIGITAL and buys those projectors, I understand that for now the films are on HD or DVD, but it seems that this will soon also be replaced by transmission through cable or satellite. Will the current digital projectors be able to receive and show movies transmitted in this way or will it require some additional hardware or even totally different projectors? Obviously all the old film projectors are now obsolete. This certainly seems a terrible waste of money & equipment. The expense involved for the cinemas must be enormous. It is very sad for old exhibitors. How on earth do they afford the conversion to digital? Either you change or perish. Can the movies I film with digital cameras be projected in movie theaters??? Awesome Stuff. There’s a lot goinn behind the screens that have been entertaining us. I commend on the fact that for some people it really does matters to know things n feed up their curiosity. Keep it up. back in the 50’s when I was a projectionist we always had a pail of water nearby. If you played a foreign language film if you skipped one reel nobody seemed to notice. 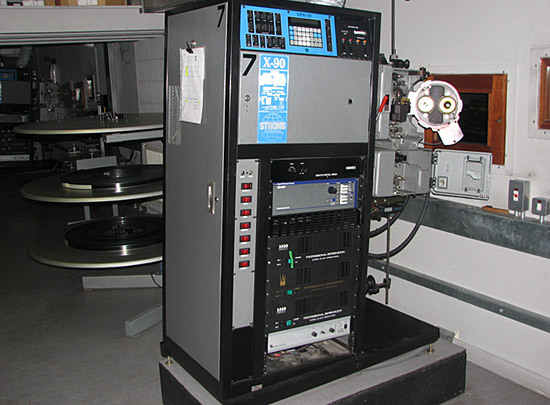 I think I would miss the smell of film in todays projection booth. Most new movies are shot in 4k or 5k. Depending on the speed of shooting and a few other factors concerning the particular camera used, the same camera that shoots in 4k can usually shoot in 2k respectively. Bernard: what was the pail of water for? I can think of a few possibilities! Tiger Sun: Have the studios not started using 8k yet? I do remember reading somewhere that 8k will basically be it in terms of further resolution development (probably!). Much beyond that, even someone with 20-20 vision won’t be able to appreciate the difference…..
Nice artical . It helped me to understand a lot. Thanks a lot. Fantastic details. Great. Felt as if I worked as projectionist all these days. Hats off.